Newfoundland had had its own currency since 1865 and over the years the people became very attached to their large one-cent pieces, an inch in diameter, and to their "fish scales," as the small silver five-cent pieces were locally known. Canada introduced its small cent in 1920 and its large nickel five-cent piece in 1922 but because of popular resistance to the change, it was not until 1937 that the government of Newfoundland officially considered adopting coin sizes similar to Canada's. 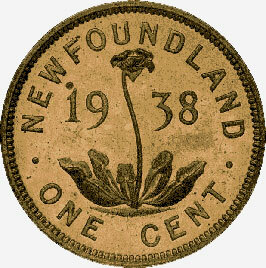 After careful deliberation, Newfoundland decided to retain the silver five-cent piece but to change to a small cent. A considerable cost saving could be effected by producing this denomination in the smaller size. The attractive reverse for the new coin, illustrated, has as its main design element the pitcher plant, Sarracenia purpurea. This plant, Newfoundland's floral emblem, is native to the island and is insectivorous. The insects are attracted by a sticky liquid at the bottom of each of the receptacle-like leaves. After the prey is trapped in the liquid, it is digested and absorbed by the plant. The first cents of the new design were struck at the Royal Mint in London in 1938. Later strikings, up to 1947, were made at the Royal Canadian Mint in Ottawa. The illustration is of a coin in the National Currency Collection, Bank of Canada.